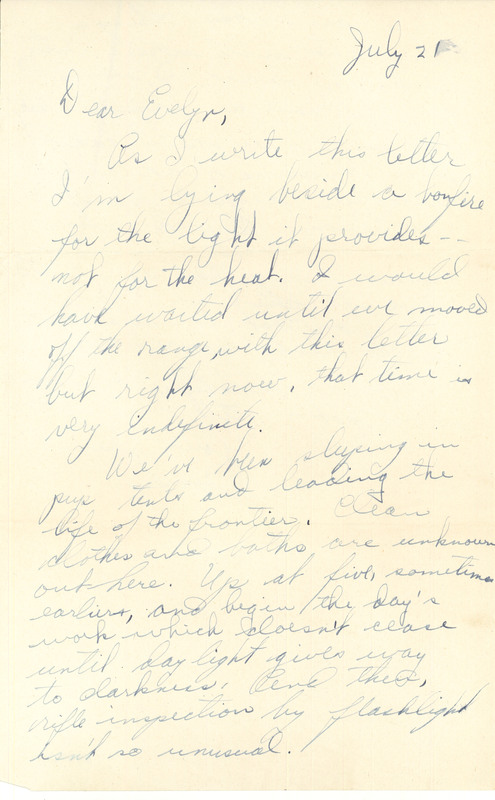 July 21 1942 Dear Evelyn, As I write this letter I'm lying beside a bonfire for the light it provides -- not for the heat. I would have waited until we moved off the range with this letter but right now, that time is very indefinite. We've been staying in pup tents and leading the life of the frontier. Clean clothes and baths are unknown out here. Up at five, sometimes earlier, and begin the day's work which doesn't cease until day light gives way to darkness, and then, rifle inspection by flashlight isn't so unusual.